The Barrett Model 82A1 was hooked up to collection instrumentation that included an eight channel analyzer set for a frequency range of 20,000 Hz with a resolution of 26,500 lines. Programming the computer to record the exceptionally quick response times was something the engineers had not done before. Convergence is the coming together of different and distinct functionalities that evolve into a combined result. The coming together of the talents of three great men has resulted in a huge leap in long-range precision fire. Early in the twentieth century, John Browning developed the .50 Browning Machine Gun cartridge (.50 BMG) based on a scaled up version of the .30-06 Springfield cartridge with its Spitzer bullet. During the war in Vietnam, U.S.M.C. sniper Carlos Hathcock placed a telescopic sight on a .50 BMG M2 machine gun to achieve a precise single shot on an armed combatant at a record-breaking distance of almost a mile and a half or 2,286 meters (2,500 yards). Beginning in the early 1980s, and with little hope of recovering his investment, Ronnie Barrett started to develop semi-automatic precision-fire rifles chambered for the powerful 12.7x99mm NATO (.50 BMG) ammunition, starting with the Model 82. Ronnie Barrett continued to develop his design and fielded the improved Model 82A1 rifle that in 1990 the United States armed forces purchased in significant numbers during Operations Desert Shield and Desert Storm. After additional trials, in 2002 the Army decided on the Barrett semi-automatic rifle that was officially adopted as the Long Range Sniper Rifle, Caliber .50, M107. Its impact and usefulness was clearly acknowledged when the M107 was voted one of 2005’s Top 10 Military Inventions by the U.S. Army. Clearly the convergence of a superior bullet, effective long range surgical application and “outside the box” weapons development has resulted in a world class game changer that has saved untold warfighter lives. A Model 82A1 barrel fitted with four pairs of mechanically filtered shock ICP accelero-meters capable of measuring the vertical and horizontal axis G-force acceleration. The 0.15 oz. sensors were mounted using foil to avoid marking the barrel. Everyone who has ever pulled a trigger on a Barrett .50 BMG weapon has undoubtedly noted the incredible power of the weapon. The efficiency of the Barrett-designed muzzle brake reduces the recoil to very mana­­­­­­­geable level so it is easy to shoot, even for quick follow-up shots, but the energy of the potent .50 BMG is still very evident. But just how much power does it see? A very good question that the Keys’ Crew based out of the Florida Keys Gun Club, asked. Our engineer, Bob Gwinn, came up with an idea based on strapping a series of high-impact accelerometers to a Barrett Model 82A1. He wanted to hook them up to a computer with the ability to record the data. We could then break down and compare the results to the universal standard for precision rifles; the Remington 700 in .308 (7.62x51mm NATO). Bob secured the needed sensors, com­­puter gear and additional engineers that could help us with developing with this new kind of research. 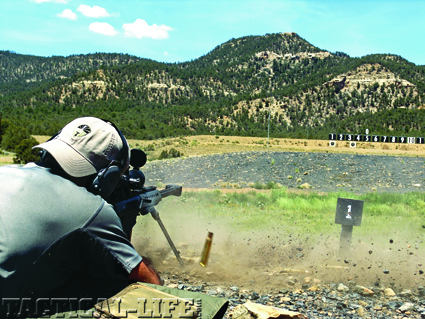 The Keys’ Crew supplied the experienced shooters of Andy Newton (IDPA State Champion), Al Di Buono (Marine Sniper–Vietnam), Steve Judd (Marine sniper–Desert Storm) to pull the trigger during the evaluation. The test platforms were the .50 BMG Barrett Model 82A1 with a Night Force Scope and 661-grain XM33 ammunition. It was compared against the Remington 700 using a free-float, BLACKHAWK! Axiom Ultra-light Knoxx stock with PMC 147-grain 7.62x51mm NATO ammo. Bob fitted the barrel of each weapon with eight mechanically filtered shock ICP accelerometers capable of measuring the instantaneous vertical (Y axis) and horizontal (X axis) acceleration—or G-forces—caused by each round fired. Each sensor had a dynamic range of +/- 50,000 G peak and a maximum of 150,000 G peak, so they should have been within the capabilities to take the data we wanted without failing. Bob Gwinn and Bob Gill mounted the 0.15-oz. (4 gm) sensors using worm clamps tightened to each barrel using foil to avoid barrel damage. To our amazement, the sensors stayed in place during the many rounds fired, and functioned perfectly. The data collection instrumentation used an eight channel analyzer set for a frequency range of 20,000 Hz with a resolution set at 26,500 lines. Why? This allowed the time sample rate needed to acquire transient data. 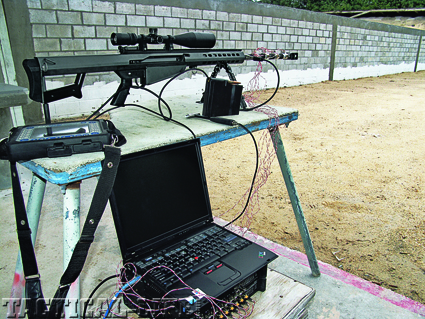 Rapid acquisition of data was needed as the barrel travel time for the bullets was between 0.765 and 0.848 milliseconds. Just to make sure, several data samples were obtained to ensure validation of the ability to record the data we needed. However, this did not mean that that the data came easily. It took a few tries to get the computer to read the information at a usable range. But when we got it, we got it! The data showed the powerful stresses experienced with every shot fired. The barrel movement response was greater for horizontal movement (windage) than the vertical (elevation) by 18% near the receiver and 14% nearer the barrel compensator. 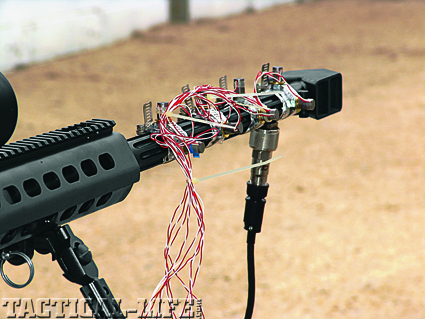 In general, the Barrett barrel vibration response was between 1,000 and 1,225 Gs peak for the firing and recoil responses based on time wave form data. In comparison, the Remington 700 maximum vibration response was 55 Gs peak. That meant that the major difference between the .308 and .50 BMG was 1,170 Gs. 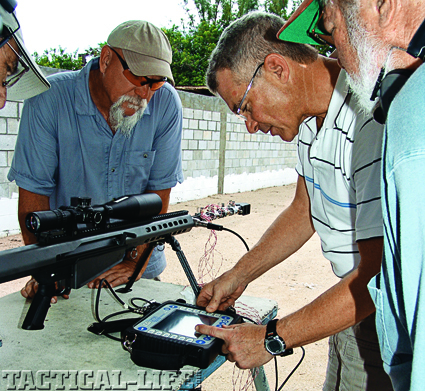 Shooter Alan Mullenax (left), lead engineer Bob Gwinn (middle) and hardware engineer Bob Gill (right) worked out the technical issues to obtain the quality data we needed to define the power of the .50 BMG Barrett. 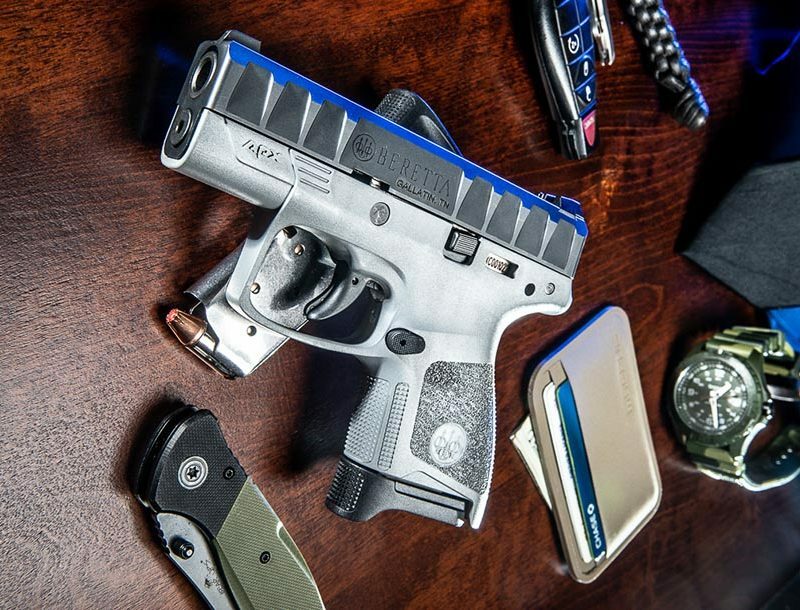 Even accounting for differences in calibers, bullet weights and barrel recoil designs, the difference is exponentially huge. We were expecting a difference between the .308 and .50 BMG, but this kind of power seen by the Barrett is absolutely incredible. However, based on initial model testing obtained prior to firing each rifle, there is no observed barrel resonance amplification from the data reviewed. If there was barrel resonance amplification, it would tend to result in abnormal barrel vibration and a very inaccurate platform. That explains why the Barrett can shoot such a powerful round, but still be extremely accurate! We obtained an incredible amount of data we are still sifting through. It showed us why the Barrett has the ability to contain and direct a huge force to place rounds repeatedly on target. Although the barrel experiences flex due to resonance, the forces are not additive and allow for repeatable accuracy when you need it. We also showed that the barrel absorbs a huge amount of energy for every shot fired and that affects everything about the weapon and why every .50 BMG barrel has a predictable lifespan. The Barrett is not your father’s deer rifle. It is the convergence of the brilliance of John Browning, the foresight of Carlos Hathcock and the efforts of Ronnie Barrett. 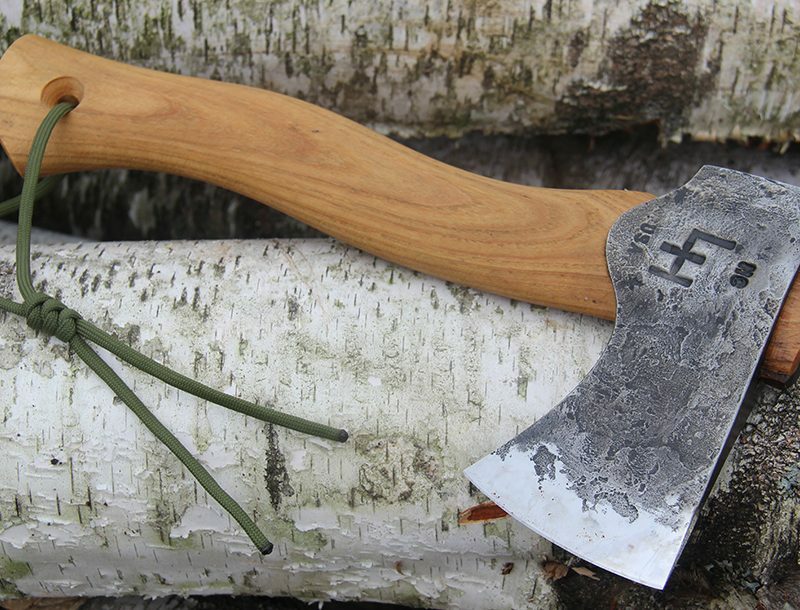 It is what our warfighters need and what we are using daily to keep our warriors well away from danger while keeping our enemies in the crosshairs. We can verify the Barrett’s power by looking at the huge number of G-forces we recorded with every shot taken, but more importantly we can see the significance of the Barrett by our boys that come home alive thanks to the power it projects. Nothing beats that data. Woman’s grandson fends off burglar with handgun.